LinkedIn is a powerful social media website that is vastly underutilized by financial advisors in their marketing and prospecting strategies. Most advisors I speak with these days have a LinkedIn profile, but they have no idea what to do with their account, so they do nothing. This detailed blog post with 2000+ words is designed to help financial advisors take the next step in using this powerful platform for marketing and prospecting for new clients. If you’ve never maximized the business opportunities available to you, this guide is for you! LinkedIn now has 450 million users worldwide which means that anyone and everyone who is someone is using this platform. Gender usage breaks down like this: 56% male and 44% female. There are now 7 mobile apps to get the most out of LinkedIn. Job search app- assist job seekers with finding open job positions. For advisors interested in prospecting, there’s also a Sales Navigator app to find leads and accounts in your target market. So, there are many ways to leverage this valuable resource, but NOT SO QUICK! There are a few things you must do prior to jumping on the LinkedIn bandwagon. This article is organized into two sections. The first gives you 9 tasks to complete prior to jumping in and the second section details 6 tactics you can utilize in your LinkedIn Marketing Plan for Financial Advisors. You’ve heard the old saying “You have to learn to walk before you can run”? Well, jumping into LinkedIn without first optimizing your profile is like trying to run a marathon before you’re physically fit. If you don’t get your profile ready for the increased views you’ll be receiving, then your LinkedIn brand will fall short. It won’t impress anyone if you don’t put time and effort into telling your story and showcasing how you’re different from other advisors. You see, with your increased activity on LinkedIn you’ll be attracting profile views from people interested in learning more about what you offer, but if your profile doesn’t say much and lacks information about your Value Proposition, these “secret shoppers” will not connect with you. That’s why it’s important to think about what’s different about you, spruce up your profile, and get it ready for viewing. Step one to improve engagement and unconscious branding is to have a great headshot for your profile. This means a photo of you with an engaging smile where you are looking directly at the camera and smiling “ear to ear.” Based on many studies, humans “connect” with others through the eyes. If your smile “reaches your eyes” then you have an engaging headshot. If your smile looks forced or doesn’t move your cheeks upwards, then you won’t be adequately connecting with others. Make sure your headshot is indeed focused on your head! Not a body shot. Not a waist up shot. Not a shot of you camping or with your dog. Keep it professional. Interesting tip: using a headshot increases your likelihood of being found on LinkedIn by 14 times! Have you achieved credentials in your financial planning career? If so, list them at the end of your name and make sure you use the registration symbols that accompany the credential. Best practices include using keywords that prospective clients would use to find you, mentioning your target market, and adding a motivational statement. The professional headline is a searchable field and factors into the traffic directed your way from a LinkedIn search. Identifying your target market in your headline helps to deepen engagement with your ideal clients. A motivational statement helps drive home the benefits of working with you. Why? To make it look more professional, instead of having all the numbers at the end of the link and also to make it easier to share on social media and in an email. You’ll also use a shortened URL in your email signature. Now that you’ve shortened or customized your URL, link to your account. Where? Use a LI logo on your business card (without a link), on your website, on website pages that contain your bio. You can ask your web designer to add a LinkedIn logo that links to your LI profile. In addition, use a logo with a link on your email signature -see below #9. You don’t need a premium account in order to use a background image that motivates your connections. Simply hover your mouse over “Profile,” then “Edit Profile,” and “Edit background.” Choose an image that is meaningful like your company logo or an image that shows potential clients the life they would have if they hired you. Make sure you legally purchase your image to avoid problems later. See my background image here. This section is your opportunity to talk about your strengths, why someone would hire you over another financial planner, discuss your ideal clients and questions they have, and mention what clients get from working with you. This is the most important part of your profile. Make sure it’s written in the FIRST PERSON so that you create further engagement with potential clients. 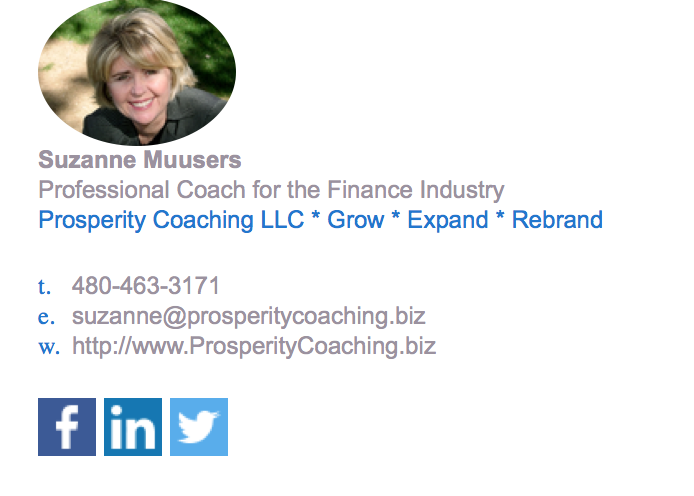 I am an expert in helping clients create this LinkedIn brand component! Studies have revealed that people often don’t know what to do next after reading content online, so tell them what to do next! Provide your contact details and use symbols to call attention to what you want people to do. You can also use a professional service (for a fee) that will design an email signature for you using a plug-in template. You are able to utilize your entire social media contact information, social media logos, plus your engaging headshot! Go to Wisestamp.com (I am not affiliated with Wisestamp, just a happy customer). Getting your profile ready for marketing and prospecting is key in being successful at marketing your firm and your benefits. Once you’ve completed the activities above, it’s time to implement a plan to leverage your opportunities. Having a LinkedIn profile is one thing, but really leveraging your exposure is quite another. There are many to-do books that can give you an overwhelming amount of information about advanced strategies. That is not my goal today. What I want for you is a plan that is easy and not time consuming to implement. I would rather you spend a reasonable amount of time each week and keep doing it, than to spend too much time and burn out. That’s why I’ve designed this plan so that Tactics 1 – 4 can be accomplished in an hour and twenty minutes per week. Not a bad time investment. Tactics 5 and 6 are a little more time intensive, so they are optional (but highly recommended). Here is an easy 6 Tactic LinkedIn Marketing Plan for financial advisors for getting the most out of your online presence accomplished in as little as an hour and twenty minutes per week. Get more exposure by liking and commenting on a post from one of your connections on the LI homepage. Are you familiar with the theory of reciprocity? The more you like content published by your connections, the more likely they will notice your content and reciprocate. Each time you interact with your contacts, your communication is magnified throughout their contacts. Do you blog? Inbound marketing is so rarely used by advisors and can be very powerful. Share your blog posts on the LI homepage. Share articles that interest you. For example, you could share articles from Inc Magazine, Fast Company, and Forbes.com. Join 3-5 groups where you target clients hang out and comment on a group discussion twice weekly. This is most powerful when you have distinguished yourself from other advisors by declaring a target market. I maintain there is a financial advisor hierarchy of income and generalists are on the bottom of the earning pyramid. If you’re targeting a particular niche, there is probably a group for said niche. So join several groups that line up with your target markets, comment several times a week, and your profile will be magnified to everyone in that group. Endorsements are a quick way of confirming that a member has a particular skill. Each time you endorse a contact, they receive notification that you done this, which increases your exposure. The more you endorse others, the better your circle of influence. On the upper right hand corner of the home page you’ll find the “Advanced” people search function. Look for opportunities to connect to a specific group of people. i.e. unemployed (“in transition,” “seeking new opportunities”), people working at a specific company you are familiar with, or a specific profession that would be a good target market for you. Think of the possibilities! If you are familiar with the Exxon Mobile pension plan and you know that a group of employees has recently been offered an early retirement package, you can bring up a list of first and second connections at Exxon and approach them offering valuable information that concerns them. The advanced search feature can provide you with as many leads and coffee meeting appointments you’re willing to spend time leveraging. It’s up to you! Pulse is self-publishing platform that is a cross between a blog and a social network. It allows writers to publish their own content that can be seen by their network. Viewers can like and comment on the posts. The trick is to write content that is helpful with a killer title that elicits emotion and to entice readers to visit your website for a special offer. I considered this option to be an advanced technique that if utilized correctly can spread your influence and increase your credibility. Well there you have it. 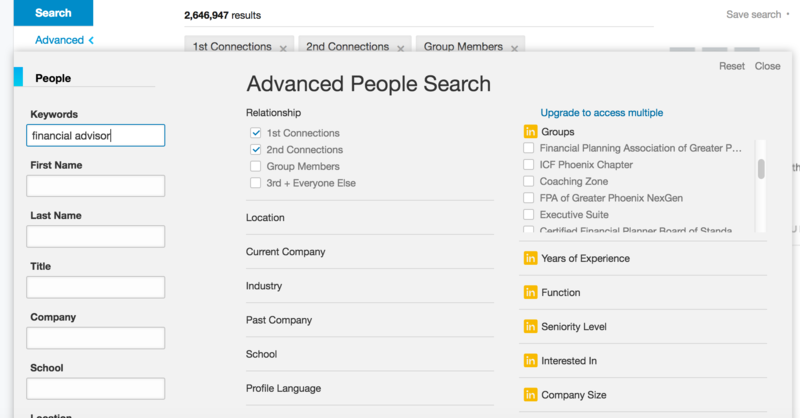 A plan for financial advisors to maximize prospecting on LinkedIn! There are important positioning strategies to accomplish PRIOR to implementing the 6 Marketing Plan Tactics. If you work this plan step by step, and if you focus one hour and twenty minutes weekly on tactics 1-4, you will get results. The key is making a plan and sticking with it! Financial Advisors: Are you playing it too safe with your marketing? 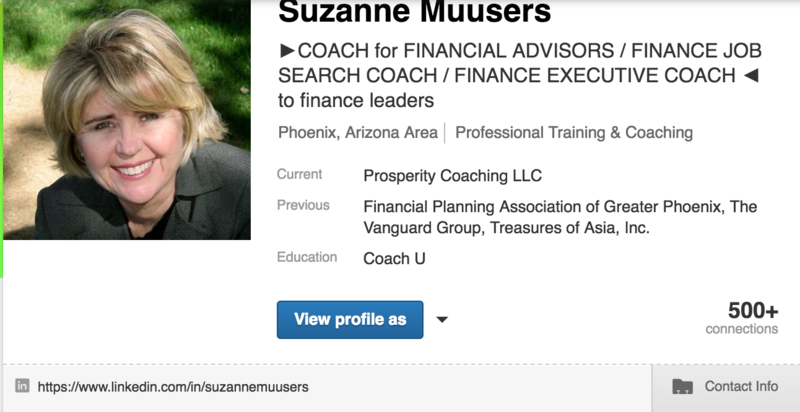 Suzanne Muusers is a Professional Coach helping finance industry professionals grow their skills, expand their minds, and rebrand their firms.